You are here:Home » MRC News » Education » Landscapes and Yards » How Does Your Lawn Hurt the Lagoon? Local leaders pass residential fertilizer controls to help protect the Indian River Lagoon from nitrogen pollution! Click here to learn more about local fertilizer ordinances. 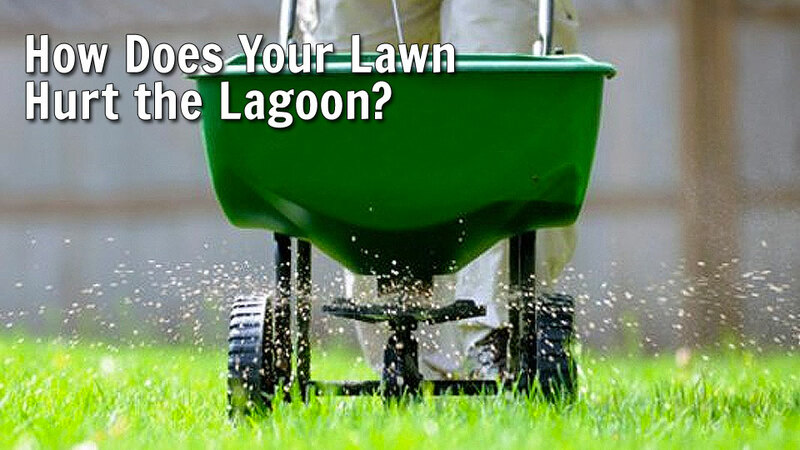 Nitrogen and phosphorous from lawn fertilizer accumulates in soils and grass clippings, runs off during rain events, and leaches through the sand and into groundwater that leads to the lagoon. Fertilizer may be the largest contributor of nitrogen to the Indian River Lagoon. Nitrogen load calculations based on typical residential fertilizer application amounts, average septic tank nitrogen releases and atmospheric deposition shows that fertilizer contributes more than three time more nitrogen to the watershed than septic tanks. Many people purchase lawn fertilizer and apply it themselves or they hire a professional company. There are differences in the fertilizer products, that vary according to the content of nutrients (N–Nitrogen, P–Phosphorous, and K–Potassium) and the slow-release capability. Martin County has a good explanation of how to read a fertilizer bag label in their fertilizer brochure. The slower-release the product, the more likely it will contribute to the growth of organics in the soil that can sustain the lawn in the long-run. In sandy soils, liquid fertilizers don’t stay around long enough to encourage microbial activity. Whatever isn’t immediately taken up by the grass, simply passes through the sand into the groundwater. The fertilizer that is taken up by the grass is stored until the grass is cut. Many grass clippings full of the chemical fertilizer will end up in the street or in the canals where they break down and release the nitrogen load directly back into the lagoon before they settle on the bottom to contribute to the legacy load of accumulated muck. Remind your professional mower to keep lawn clippings out of the street!